Single Port Access for Laparoscopic Adjustable Gastric Banding with Regular Laparoscopic Instruments Is Feasible and Economic. Introduction: Single Port Access (SPA) has been gaining popularity among patients due to the cosmotic benefits. SPA contradicts the basic rules for laparoscopic ports insertion locations. Special articulating instruments are expensive and adds more dollars to the health care bills. Materials and Methods: In our institution we performed 21 single port access using the regular straight laparopscopic instruments. A 30 degree scope was used for visualization. Three trocars (one 15 mm and two 5 mm) were inserted in a one and half inches incision. The placement of the incision was either in the umbilical scar or in the left upper quadrant. The pars flaccida technique was used. Intracorporeal stitching was the tecnique used to anchor the stomach and the band. 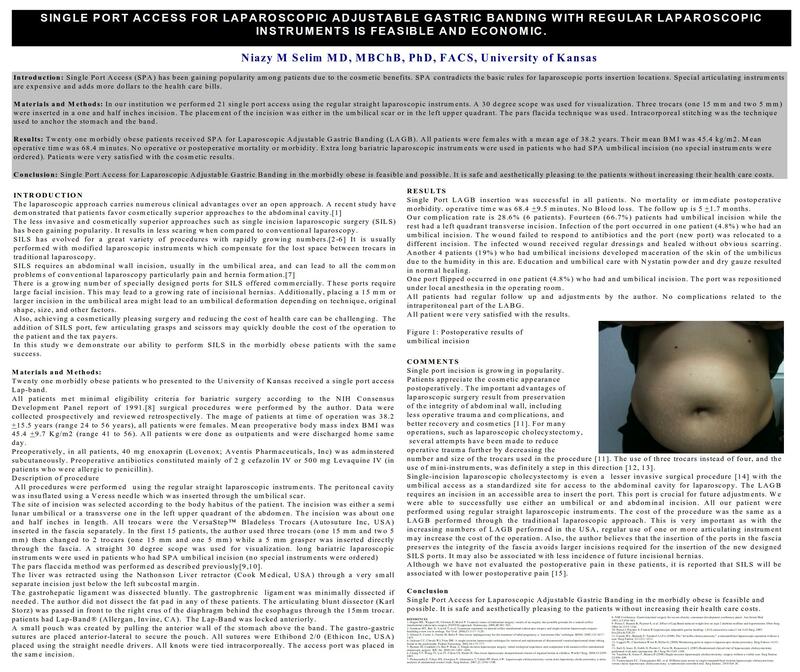 Results: Twenty one morbidly obese patients received SPA for Laparoscopic Adjustable Gastric Banding (LAGB). All patients were females with a mean age of 38.2 years. Their mean BMI was 45.4 kg/m2. Mean operative time was 68.4 minutes. No operative or postoperative mortality or morbidity. Extra long bariatric laparoscopic instruments were used in patients who had SPA umbilical incision (no special instruments were ordered). Patients were very satisfied with the cosmetic results. Conclusion: Single Port Access for Laparoscopic Adjustable Gastric Banding in the morbidly obese is feasible and possible. It is safe and aesthetically pleasing to the patients without increasing their health care costs.